The Grade 6 students at Nesbitt School were lining up for their turn to greet Athena and Sofia. Having done this activity many times before, the dogs stood expectantly at our sides with their tails wagging softly. Each student would have a chance to practise politely greeting a dog with both of our canine ambassadors. We discussed the importance of steps such as asking the guardian’s permission and letting the dog choose to come to you as opposed to going into their space. “This is Athena. 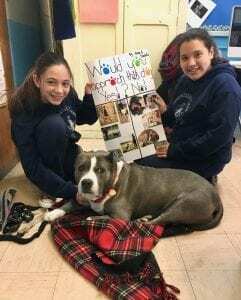 She was adopted from an animal shelter,” I said to my group of eager students, introducing the 9-year-old American Staffordshire Terrier at the end of my leash. My colleague stood in the other corner of the classroom with Sofia, a happy-go-lucky Shih Tzu who stood below the knee. Welcome to one of the workshops offered by ENGAGE: Animal Welfare Education, a non-profit organization dedicated to building empathy among youth. According to Edutopia, empathy builds positive classroom culture, strengthens community and prepares your students to be leaders in their community. Empathy builds positive classroom culture. Empathy prepares your students to be leaders in their community. 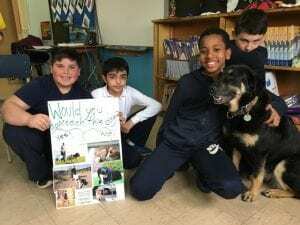 Youth are often drawn to animals and there is now a wealth of research linking animal-assisted programs to the successful development of empathy and pro-social behaviour. Through ENGAGE’s interactive programming, students learn how they can improve the lives of animals in their communities – something that is not only good for the animals themselves, but also serves to empower youth and foster civic engagement. Bringing Athena and Sofia into a classroom enables students to learn how to listen, understand, and respect dogs and in so doing, practise the values of compassion, cooperation, and responsibility. ENGAGE’s humane education programming strives to create links between youth, animal shelters and the general public in order to advance animal welfare in the community at large. At the core of its philosophy is the facilitation of projects in which youth can improve the lives of animals in their communities. One such activity has students writing for an authentic purpose as they craft descriptive adoption profiles for cats waiting to be adopted in local shelters and by animal rescue groups. 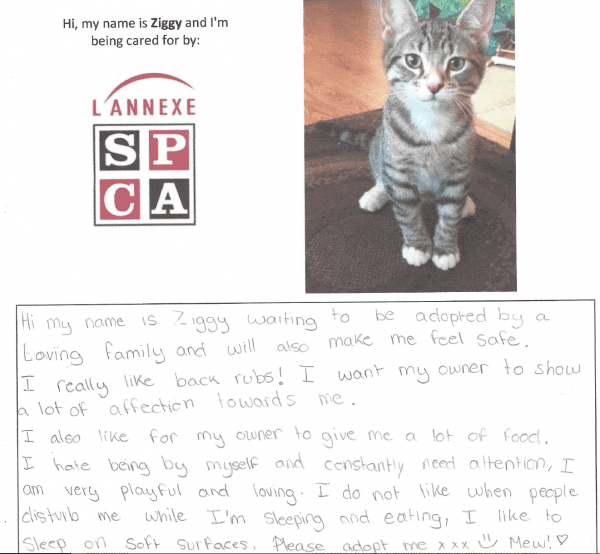 Written by the students from the perspective of the cat, these profiles are powerful empathy building activities that also benefit shelter cats as they are then used by these organizations to promote adoptions. Educators can foster the development of empathy by finding ways to integrate animal welfare into the curriculum in subjects such as English Language Arts, Science or ERC. The fact that all animals are sentient beings, with experiences and interests of their own, can be continuously communicated to students and students can be given the space to tell their own stories in various media about their relationships with the animals that surround them. Edutopia: Empathy in the Classroom: Why Should I Care? *A previous version of this post incorrectly attributed the authorship of this piece to Colleen Ovended. The correct author is Emelie Luciani.